Central idea: The Word became flesh. Doctrine: The Son became incarnate to do the Father’s will. Practical application: Contemplation of the Unborn Christ. Micah prophesizes the Messiah, that is, the man God has chosen and sent to redeem his Chosen People. He will come from Bethlehem because he is a descendent of David. In his human nature, “his origin is from old” because of his Davidic ancestry. In his divine nature, “his origin is from old” because he always was. God will begin a new era in salvation history “when she who is to give birth has borne” for “his greatness shall reach to the ends of the earth; he shall be peace.” In light of the Gospel, this passage can be interpreted to mean that Mary’s child will reconcile all mankind with God. Christ does “stand firm and shepherd his flock by the strength of the Lord,” and the clue by which he will do it is given in the phrase, “he shall be peace.” The strength of the Lord consists of perfect self-giving love no matter what. The Chosen People would have expected a different kind of strength. They could have hoped for gentleness and kindness toward themselves but iron strength against all opponents or enemies. We might wish him to, but God will never “make us” turn to him. He certainly invites us and gives us the grace to repent and to seek his face. In Christ, the Blessed Trinity has given us a face to see, the face of Christ who has saved us. This vine planted by God is the Christ. This man of “your right hand,” this “son of man whom you yourself made strong,” is our help and our salvation. We receive new life through him. As Christ said, “I am the vine and you are the branches” (Jn 15 ff.). Under the Old Covenant, the Chosen People offered sacrifices through priests to thank God for the blessings they had received and to atone for their sins. What is God’s will? It is perfect self-giving love. That is what Christ did, come what may. Because Elizabeth was advanced in years, to serve her cousin, who would find it harder and harder to do her daily tasks as her pregnancy advanced, and who would need someone to help her once her baby was born. Lord, please give me incredibly good thing also! Lord, let me see with my own eyes that your promises are true! Lord, let me be with brothers and sisters who also belong to you and who are carrying out your plans! Lord, let me find joy in serving others in their need! 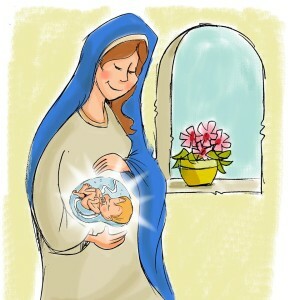 We now know enough about the bond between a mother and her unborn child and between an unborn child and the outside world, to know that the unborn six-month-old John both heard Mary’s greeting and both heard and felt his mother’s joyful response. If his mother, Elizabeth was filled with the Holy Spirit, why could John also not be filled to his capacity? So he leapt with joy—along with, or because of, or as the cause of, his mother’s joy. How blessed are we if we can be the source of another’s joy. How blessed are we if we can share in the joy of another. In causing, sharing in, and receiving joy, we are in the trinitarian image of God in his inner relations of generation, reciprocal love, and spiration. Filled with the Holy Spirit, Elizabeth “knew” that Mary was pregnant, that Mary’s child was Elizabeth’s “Lord,” and so, that Mary was incredibly blessed. In fact, Mary was blessed two-fold. She was blessed objectively, because of her child and because she was chosen to be the mother of that child. She was blessed subjectively, because she believed that what God told her would come true. What did God the Son do? The Son of God became incarnate. The “Incarnation”—literally infleshment—is the theological term that captures St. John’s expression, “The Word became flesh.” It is “the fact that the Son of God assumed a human nature in order to accomplish our salvation in it” (CCC 461). Christ’s Incarnation refers not just to Christ’s body. It means the Second Person of the Blessed Trinity, with his divine intellect and divine will, joined to himself a complete human nature: his human body with its emotions and passions and his human soul with its human mind and human will. Did Christ do this? Why did he do this? Our second reading expresses that he did this and why he did it. Christ took on human flesh to do God’s will: “Sacrifices and offerings you have not desired, but a body have you prepared for me; in burnt offerings and sin offerings you have taken no pleasure. Then I said, ‘Lo, I have come to do your will, O God’” (CCC 462). It is completely endearing that he chose to arrive in the womb of the Blessed Virgin Mary as an embryo and to develop there, to be born, and to grow up from childhood to manhood in a family. What is the will that Christ came to do? The Father’s will is his “plan of redeeming love.” Jesus embraced this every moment of his life—including all his ordinary activities—including his life of prayer (CCC 2568)—but it reached its pinnacle in “his redemptive passion” (CCC 607). We can then meaningfully contemplate every stage of Christ’s life. Did Christ fulfill the Father’s will? “In Christ, and through his human will, the will of the Father has been perfectly fulfilled once for all” (CCC 2824). What is the consequence of this fulfillment of the Father’s will? We are delivered from sin and sanctified (CCC 2824). With Our Lady, we adore Christ as a newborn baby at Christmas when we gaze at a Nativity scene. Or we contemplate the childhood of Christ in the Joyful Mysteries of the Rosary. Or we meditate on his public life in the Luminous, Sorrowful, and Glorious Mysteries of the Rosary. With Our Lady, why can’t we adore Christ as an unborn baby in the womb of the Blessed Virgin Mary in this last week before Christmas? We can bring everything we happen to know about fetal development, the experiences of a pregnant woman, the reality of who this unborn baby is, the reality of who this mother is, and their mission which God the Father has set for them. Then we can ask Our Lady and her Son, What is my place in the Father’s plan of redeeming love?